How do innovators and early adopters succeed in spreading new ideas, new tech, and even new seed corn? 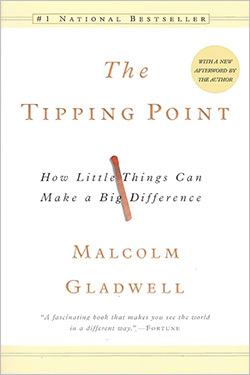 We continue our Leadership Hall of Fame series, a year-long look at the top business books and authors, with an excerpt from The Tipping Point (2000) by Malcolm Gladwell. The diffusion model is a detailed, academic way of looking at how a contagious idea or product or innovation moves through a population. One of the most famous diffusion studies is Bruce Ryan and Neal Gross’s analysis of the spread of hybrid seed corn in Greene Country, Iowa, in the 1930s. The new corn seed was introduced in Iowa in 1928, and it was superior in every respect to the seed that had been used by farmers for decades before. But it wasn’t adopted all at once. Of the 259 farmers studied by Ryan and Gross, only a handful had started planting the new seed by 1932 and 1933. In 1934, 16 took the plunge. In 1935, 21 followed, then 36, and the year after that a whopping 61 and then 46, 36, 14, and 3, until by 1941, all but two of the 259 farmers studied were using the new seeds. In the language of diffusion research, the handful of farmers who started trying hybrid seed at the very beginning of the 1930s were the Innovators, the adventurous ones. The slightly larger group who were infected by them were the Early Adopters. They were the opinion leaders in the community, the respected, thoughtful people who watched and analyzed what those wild Innovators were doing and then followed suit. Then came the big bulge of farmers in 1936, 1937, and 1938, the Early Majority and the Later Majority, the deliberate and the skeptical mass, who would never try anything until the most respected of farmers had tried it first. They caught the seed virus and passed it on, finally, to the Laggards, the most traditional of all, who see no urgent reason to change. If you plot that progression on a graph, it forms a perfect epidemic curve–starting slowly, tipping just as the Early Adopters start using the seed, then rising sharply as the Majority catches on, and falling away at the end when the Laggards come straggling in. The message here–new seeds–was highly contagious and powerfully sticky. A farmer, after all, could see with his own eyes, from spring planting to fall harvest, how much better the new seeds were than the old. It’s hard to imagine how that particular innovation couldn’t have tipped. But in many cases the contagious spread of a new idea is actually quite tricky. Moore’s argument is that the attitude of the Early Adopters and the attitude of the Early Majority are fundamentally incompatible. Innovations don’t just slide effortlessly from one group to the next. There is a chasm between them. All kinds of the high-tech products fail, never making it beyond the Early Adopters, because the companies that make them can’t find a way to transform an idea that makes perfect sense to an Early Adopter into one that makes perfect sense to a member of the Early Majority. Moore’s book is entirely concerned with high technology. But there’s no question that his arguments apply to other kinds of social epidemics as well. In the case of Hush Puppies were identified with a dated, kitschy, fifties image. They were wearing them precisely because no one else would wear them. What they were looking for in fashion was a revolutionary statement. They were willing to take risks in order to set themselves apart. But most of us in the Early and Late Majority don’t want to make a revolutionary statement of take risks with fashion at all. How did Hush Puppies cross the chasm from one group to the next? Lambesis was given a shoe that had a very specific appeal to the southern California skateboarding subculture. Their task was to make it hip and attractive to teenagers all over the world–even teens who had never skateboarded in their life, who didn’t think skateboarding was particularly cool, and who had no functional need for wide outsoles that could easily grip the board and padded uppers to cushion the shocks of doing aerial stunts. That’s clearly not an easy task either. How did they do it? How is it that all the weird, idiosyncratic things that really cool kids do end up in the mainstream? This is where, I think, Connectors, Mavens and Salesmen play their most important role. They are the ones who make it possible for innovations to overcome this problem of the chasm. They are translators: they take ideas and information from a highly specialized world and translate them into a language the rest of us can understand. Mark Alpert, the University of Texas professor whom I described as the Ur-Maven, is the kind of person who would come over to your house and show you how to install or fix or manipulates a very complicated piece of software. Tom Gau, the quintessential Salesman, takes the very arcane field of tax law and retirement planning and repackages it in terms that make emotional sense to his clients. Lois Weisberg, the Connector, belongs to many different worlds–politics, drama, environmentalism, music, law, medicine, and on and on–and one of the key things she does is to play the intermediary between different social worlds. One of the key figures at Lambesis was DeeDee Gordon, the firm’s former head of market research, and she says that the same process occurs in the case of the fashion trends that periodically sweep through youth culture. Excerpted from the book The Tipping Point: How Little Things Can Make a Big Difference by Malcolm Gladwell. Copyright © 2000 by Malcolm Gladwell. Reprinted with permission of Little, Brown and Company.